Brief Synopsis – Documentary where they try to discover what kind of influence Star Trek has had on society and technology over the 50 years since it’s debut. My Take on it – I have always been fascinated by the idea that science fiction helps further advances in technology because they give scientists great ideas of things to develop. When I read the premise of this documentary, I was extremely excited because I assumed that that was the premise of this film. 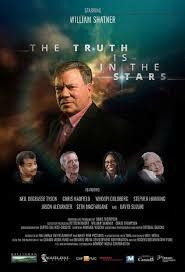 This film is a mediocre look as mini-interviews that William Shatner conducted with celebrities (actors, comedians and even a few famous astronauts) in preparation for his big interview with famed physicist Stephen Hawkins. I had hoped that Shatner would meet with experts on the subject to try and show what technologies have come about based on what people saw in Star Trek, but that was not to be the case. I’m not saying that that isn’t an interesting idea, but…. why would they make a movie about it. Yes, a number of the interviewees discuss how it helped show that in the future there will be tolerance and equality between the sexes no matter your race and this is interesting to hear about. This film doesn’t really give us any groundbreaking information about the influences of Star Trek, but it’s still fun to watch just once. Bottom Line – Interesting premise that comes across as being more disappointing that one would expect. The choice of people to interview are mostly famous people instead of really experts on the technological aspects of it all. This didn’t really further my knowledge of the information about influences of the show which is what I had really hoped would happen here.